Allergy is when the body has a reaction to a protein (e.g. foods, insect stings, pollens) or other substance (e.g. antibiotic). These substances are called allergens, and for most people they are harmless. 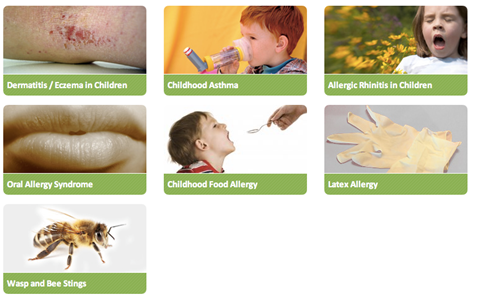 Common things that children are allergic to include: food (e.g. peanuts, tree nuts, milk, eggs, wheat and fish), pollens from tree and grasses, house dust mite and insect stings. Allergic symptoms can affect the nose, throat, ears, eyes, airways, digestion and skin in mild, moderate or severe form. These symptoms can go largely unnoticed until a child has been suffering with the problem for some time. 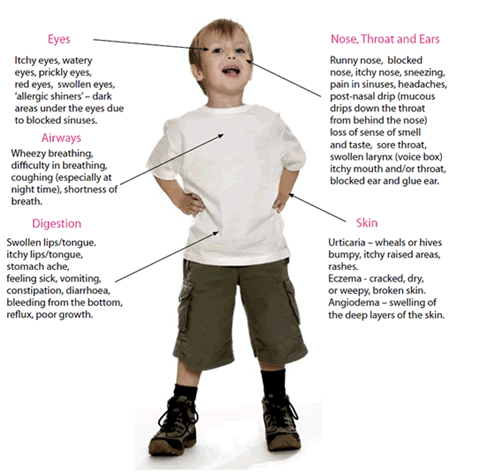 When a child first shows signs of allergy it is not always clear what has caused the problem, or even if they have had an allergic reaction, since some allergic symptoms can be similar to other common childhood conditions. However, if the allergic reaction is severe, or if the symptoms continue to re-occur, it is important that their symptoms are investigated. The most important fact to remember is that if a child does develop an allergy, with early diagnosis and treatment of this condition, it will be easier to manage the symptoms and help minimize their effects on the child's daily life. 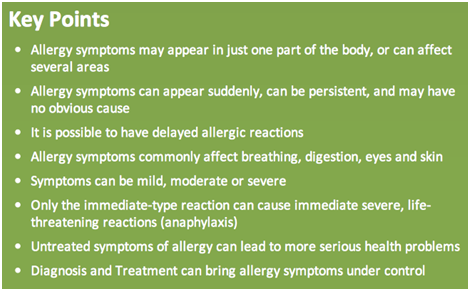 Allergic diseases (or conditions) are characterized by a range of symptoms. Where these symptoms are caused by an allergic reaction the condition is known as an atopic disease. If your child shows signs of a serious allergic reaction, call Ambulance or seek immediate medical care at a hospital emergency room. And if your child has a known allergy keep medications close. Step 1: Give anti allegic right away. If you are alone with your child, administer this medication first, then call ER. If you are not alone with your child, have someone else call Ambulance while you administer the medication. Step 2: Call Ambulance or get to the nearest emergency room. Sometimes a child has a second wave of symptoms (called a biphasic reaction). So the hospital will observe your child for at least 4 hours to be sure he or she is OK and provide additional treatment, if needed. Serious allergies can be alarming. But they're a lot easier to recognize and treat now than in the past, thanks to greater awareness and the availability of epinephrine. Also, make sure that any caregivers, teachers, or coaches know about the allergy and what to do in an emergency. Kids with severe allergies can be at risk for a sudden, potentially life-threatening allergic reaction called anaphylaxis. This reaction can be frightening a child may feel like his or her throat is closing or might faint, for example. 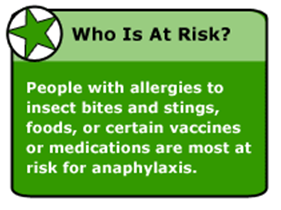 But the good news is that when treated properly, anaphylaxis can be managed. An allergic reaction might be a medical emergency if it happens in two or more of these systems for example, hives on the skin together with stomach pain. They should have proper contact numbers in case of emergency. Keep windows closed and use air conditioning if allergic to pollen. Don't use fans since they can stir up dust. Filter the air. Cover air conditioning vents with cheesecloth to help filter pollen and use high efficiency particulate air filters. Clean air filters frequently and air ducts at least once a year. Keep the humidity in your house below 50% to help prevent mold growth. If you have pets, consider keeping them outside or perhaps ask someone else to take care of them. Animal hair and saliva are common allergens for many people. If you must keep your pets indoors, do not allow them in the bedroom and be sure to bathe them often. Avoid areas where molds may collect, including basements, garages, crawl spaces, barns and compost heaps. Have someone else clean these areas often. Install dehumidifiers in basements and other areas of the house where molds tend to collect. Clean these devices every week. Simple mold testing kits are available in big box stores and hardware stores. They are easy to use and will at least tell you if you have a lot of mold as opposed to a minimal amount. If it is a lot, you can pay more attention to getting rid of mold, especially in the rooms you spend the most time in, for example, the bedroom. Check the forecast. Stay indoors as much as possible on hot, dry, windy days when pollen counts are generally the highest. Try to avoid extreme temperature changes -- they are triggers for some people with asthma. If possible, keep children indoors between 5 and 10 a.m. when outdoor pollen counts are usually highest. Make your child Wear a mask when they are with you in gardening, as flowers and some weeds release pollen and can cause allergy symptoms. After being outdoors, make your child take a shower, change clothes to remove pollen that may have collected in your Child's clothes and hair. To protect your child from insect stings, make them wear shoes, long pants and sleeves, and do not allow them near scented deodorants, perfumes, shampoos, or hair products. Carry doctor prescribed medicine always with you. Don't hang clothes or linens out to dry as pollen and molds may collect in them and can make allergies worse. Pack your child's medicines with you in your carry-on bag. Bring an extra supply of medicines in case you need them. Remove feather pillows and ask for synthetic, non-allergenic pillows -- or bring your own plastic pillow cover from home. For food allergies, avoid the foods that cause your allergy symptoms by carefully reading ingredient labels and asking about the food preparation methods when dining out. Choose fresh foods rather than prepared or processed foods. If you have severe reactions, such as anaphylaxis,ask your doctor about an epinephrine injection kit that you can carry at all times. Ask how many kits you should have and where they should be kept. If your child suffers from food allergies, discuss them with school officials, teachers and lunchroom staff. Educate your child about his/her allergies early, so your child can learn to avoid situations where he or she may eat a food that will trigger an allergic reaction. Arrange for one or two epinephrine kits to be left at the school, and make sure school officials (and your child when they are old enough) are able to use it correctly. Inform school personnel about the medicines your child is taking and make arrangements to leave necessary medicines at school. Encourage sports participation, but inform coaches of medicines that may need to be taken before activities. 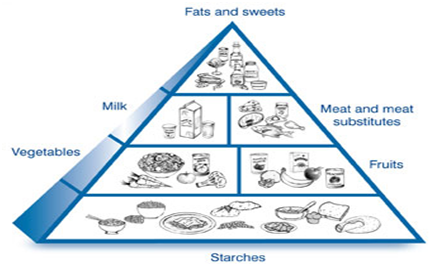 Sample Diet Plan- If allergic to Milk use Soy/Almond or coconut substitutes.